Rabbi Moshe Gutnick believes there is no place for homophobia in authentic Judaism. THERE is no doubt that the Torah forbids male homosexual acts. The prohibition exists whether or not homosexuality is considered by society normal or abnormal, or whether or not scientifically it is considered a matter of genetic predisposition or a learned behaviour. The Torah, in its divine wisdom, forbids such behaviour regardless of the answer to the above questions, and while it may even be that a person has no choice as to their sexual orientation, they always have a choice whether or not to engage in a prohibited act. Indeed, one of the most difficult challenges facing the rabbinate is how to authentically convey that message while retaining the dignity of the individual and without harming their self-esteem. Indeed the challenge is greatest for the individual himself, who may have a homosexual orientation but wishes to be observant of, if not all the commandments, as many as he is able – and at the very least accepted by his fellow Jew. We must never underestimate the enormity of that challenge. Whether or not an individual is able to deal with that challenge, they must always be made to feel welcome and they must never be made to feel that they lose their Jewish identity or ability to worship as a Jew. There is no place for “homophobia” in authentic Judaism; there is no place for being judgmental. Indeed every command of the Torah must be observed, but that includes the command that we love as ourselves, even one who transgresses. There is “no one righteous on Earth, that does only good and never sins”. 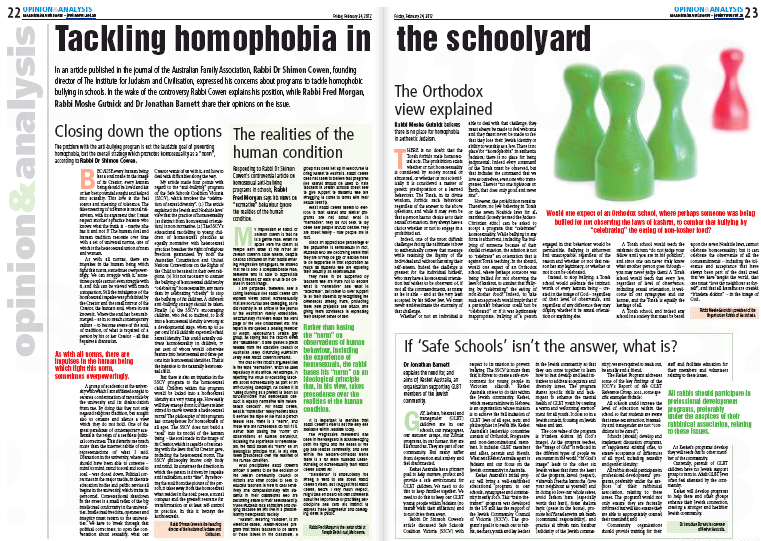 This entry was posted in GLBTIQ, Health/Welfare, Jewish, Youth and tagged Homophobia, Homosexuality, Noahide Laws, Orthodox Judaism, Rabbi Moshe Gutnick. Bookmark the permalink.